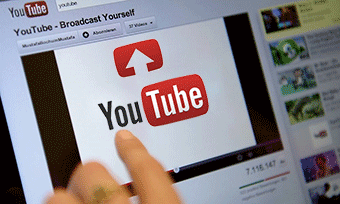 Since its beginnings in 2005, YouTube has undergone an immense rise in popularity. Each day more than 3 billion videos stream into coffee shops, college dorm, office cubicles, etc and 48 hours of video are shared to YouTube every single minute. Particularly, YouTube fans are more favored to upload HD video to YouTube, attributing to its super-high definition and faithful quality. But for HD videos, the problem is HD option increases the size of videos, though it has startling clarity, with the quality more faithful to the format in which it was originally recorded. The larger size and better quality, worse still, means the video requires more data and demands a fast broadband connection for flawless streaming. So problem always follows when you want to put HD video clips to YouTube. In the meantime, HD videos are usually saved in MKV, MTS, M2TS, AVCHD, etc, which are not in the YouTube supported list. To cater to YouTube fans's need, this article will show you the supported format for YouTube and how to post HD videos footages to YouTube effortlessly. To upload HD videos to YouTube, you must make sure your videos is accepted by YouTube. 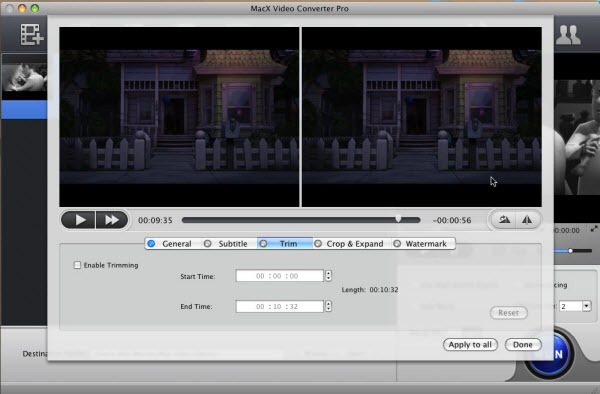 MacX Video Converter Pro can precisely convert your recording HD videos to YouTube supported formats, codec, size etc. for uploading. Aside from MP4 format, YouTube accepts a wide range of video file formats such as .WMV, .AVI and .MOV but you may get the best results from converting your file to MPEG4 video with MP3 audio. If your current video formats do not be supported by YouTube, you may get the best uploading result from converting your HD video to MP4 with professional YouTube HD video converter. MacX Video Converter Pro helps you convert any HD or SD video format to YouTube friendly format such as MP4, WMV, AVI, MOV, FLV, WebM etc. It provides optimized preset for HD video (even Ultra HD 4K video footages to YouTube) without scarifying image quality. The videos are being converted retroactively by YouTube for HD playback no matter what media you create by using Canon/JVC/Panasonic camcorder. Run Youtube Video Uploader, drag & drop the video source or add the video clip you want to put to YouTube. YouTube fully supports MP4, FLV, MOV and other video format. This YouTube HD video uploader helps you to convert video to YouTube format. Simply click "YouTube Video" to convert videos. 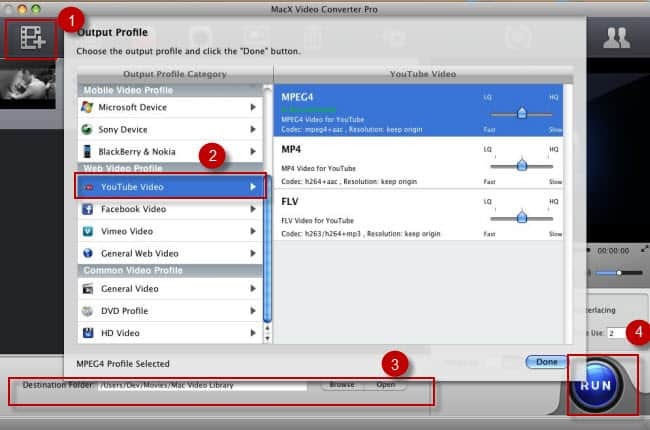 (MPEG4 for YouTube is recommended in this tutorial guide). 3. Specify the output folder. Click "Browse" button in output setting area and select a destination folder to save the converted video. 4. Start the video to YouTube conversion and upload HD video to Youtube. Hit "RUN" button to start the video conversion and the video will be converted in the specified folder. When done, you need to log in your YouTube account to post HD video. This method can be also applied to upload Instagram videos, fix Facebook video uploading errors too. The process of putting HD video to YouTube is incredibly easy. Moreover, if you want to share video files to YouTube from photo slideshow, webcam recorded video, MacX Video Converter Pro works as best-ever photo slideshow maker to create animated photo slideshow with your photo album. Or you may create video gallery by recording camera video or on-screen activity in minutes then transfer them to YouTube later.